“This disrespect of the government of the Christian rights is to be denounced. It just proves that the government is not sincere in its 1Malaysia slogan,” added the head of the Malacca and Johor diocese. For full report in FMT read HERE. During the said three GEs (1986, 1990 & 2004), your truly have never heard Malaysians of whatever faith complaining about the GE being held on a Sunday except on this occasion. Just wonder, what has inspired a bishop of Reverend Paul Tan’s standing to make such sweeping statements when there were three previous GEs held on Sunday? It would be nice if you just leave Bishop Paul Tan’s comments alone. He’s an apolitical church leader after all and it would do you no good to criticise him. It wud be nice if Dumb Tan doesn’t even say anything in the first place. His remarks attract response… He knew it and he expect it. What is he up to actually ? Ur dumber! U think ur too smart. Loser. I am baffle too. I haven’t a slightest idea that this is going to be an issue with Malaysian at all. The Christian is about 9% and not everybody goes to Church, anyway. Their masses can also be held on Saturday. When Christmas, Easter or any other celebration falls on Saturday and after partying and boozing the whole night, Churches have been known to postpone Sunday’s congregation to another day. I do not see any problem at all. Or is it a case of ‘sudah besar kepala’ and ‘sudah diberi betis, mahu peha pula’? For God’s sake, I hope Lim Guan Eng will not support the Bishop on this issue of Sunday being declared a polling day. He will only alienate further DAP supporters who are Buddhist and Hindus, the second and third largest faith in Malaysia, respectively. Bishop Paul Tan was quick to condemn Najib Razak’s decision to set the 13th General Election on a Sunday (May 5th) as a show of disrespect to Christians in the country and “just proves that (his) 1Malaysia slogan was merely rhetorical and not intended to be substantive”. The Bishop intended to sound harsh. Unfortunately, he was also a little too hasty and, I’d hasten to add, pitifully ignorant. He was obviously not aware that Venezuela, where well over 95% of the population adheres to Christianity, had just gone to the polls to elect their new President – on a Sunday. Sunday is a holy day for the Christians in Venezuela, too, I am sure. So Bishop Paul, you were saying something about disrespect to Christians? Sheer nonsense. If they can run riot everyday, what makes Sunday so holy for them? Do they pray 24 hours on Sunday? What about closing markets, shopping centers, parks and other ameneties too so they can go pray all day too? I don’t think the Christians pray on Sunday from 8am to 5pm.,no tea break and perhaps lunch lo.Use your good common sense Mr.Bishop,Don’t fool fellow Malaysians.Polling on Sunday enables voters to balik kampung to vote or vice versa.Perhaps the Church services can start around 6am ie Subuh prayer for Muslims. this are plan and deliberate BN bashing from man of the clothe or is it the church…..who know because he sure takes a long time for him to complain, announcement by EC was done days ago, if he was sincere about it he would complain immidiately then…. I wish PR will nominate Bishop Paul to stand as a candidate..in a constituency dominated by Christians…ada berani? Bishop Tan is definately now apolitical. He biase in obvious. And, for a “holy” man to make such a statement in a multi-religious country is disappointing and unacceptable. He is no difference from the hard line extremist stand taken by other religious based party whom they have often condemned. Polling is from 8 in the morning and close at 5 in the evening. What took them so long to pray on Sunday. What if SPR sets polling day on Friday. Would those Mullahs in PAS object instead? I think, it’s about time we bar or gag religious people, of all faith, from speaking of how to run or administer the country. Hope you can highlight this comment in your blog.. this written by a Catholic who really have hurt by this Bishop, bringing Jesus / church in disgrace. 1. Jesus came to Bishop and told him.. only in Malaysia, Christians cannot pray because they must go for voting.. so He told Bishop to protest. A. If you cannot go to PJ to vote, how long are you already in Johor Bahru.. WHY did not you change your voting centre all these years? C. Church is not a NGO.Remember that Bishop. You are Bishop, not layman politics. Are you getting guidance from your dogs that you are breeding? Are you answerable to the dogs, not the GOD that given you the grace to uphold the sanity of the Church? D. Why are you bring the Church in shame by issuing statements anti establishment but KEEP quiet on issues involving the oppositions such as Kg Buah Pala, Temple demolishment, DAP election fiaso, the million that illgotten by the leaders (they saved from small? ), the increase of hundreds of sin clubs in Selangor,the arrogance of the leaders in suing/blocking newspapers from their press conferences, meetings, what more Bishop… maybe another hundred list we can put here. 5. Have you EVER issued a STATEMENT of praise or compliments for giving approvals to Churches lands/permits etc, appointment of embassy, approval to visit to Jerusalem by Christians, ANY STATEMENT to a good cause by the Govt in helping the needy? 6. Did Jesus told you… DO NOT PRAISE but only CONDEMN, and CONDEMN everything? 7. Please resign your position as Bishop and be a layman and give statements/go and demostrate, handover pamphlets as a politician BUT not as a KEEPER/Guardian of a holy place called CATHOLIC Church. You are making Catholics shameful because of your BEHAVIOUR !!!! SHAME on you, I wonder if there is NO Church authority in Malaysia who can kick him out of his post and ask him to join politics. Many Christians especially your youths have forgotten that there is a Sunday Mass in your church and a day of obligation. Are you telling that sunset Mass is illegal, Christians can or must go only Sunday Mass? Shame,Shame, shameful person you are together with the wolfs in disguise. Jesus is CRYING seeing you in disgrace shooting your mouth in His name. Why there were 3 GEs on Sunday? I think we should ask why nobody in the BN government had spoken up before OR why the BN govt had ignored any previous complaints that may have been communicated in private. Despite his bombastic langauge, he does look a little confused doesn’t he? Or rather mischievous, just like Dennis the Menace? Good combination lah this Catholic bishop and tthe DAP: one tries to pit Christians (or Catholics) against Malay Muslims while the other tries to pit Chinese against Malay Muslims, the alliance with PAS notwithstanding. What does this fellow want, really? He’s been about this for some time now. Very calculated and selective pronouncements. Maybe he is a heretic. Do you know what the Spaniards and the Puritans of America did to those they considered heretics? 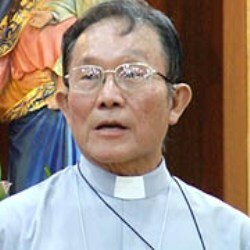 Bishop Paul Tan probably thinks that only Malaysian Christians are true christians. Christians from any country that conducts general election on a sunday, Venezuela included, are not real Christians. Christians who do not go to church and pray from 8am to 5pm are not real Christians. I am really confused with what this Bishop and DAP Christians want actually. There were also Street Demonstrations and Sport Events organised on sundays. Shopping Malls and Cinemas are opened every sunday too. Why are Christians busy going to these places instead of spending the whole day in church? I think the Bishop actually condemns Christians. Or maybe, the Bishop is not a Christian after all. Or different country different type of christianity. Once, when Jesus sent his disciples out, he advised them, “Do not go among the Gentiles, or enter any town of the Samaritans. Go rather to the lost sheep of Israel” (Matthew 10:5-6). In another place we find Jesus said to a woman of Canaan, “I was sent only to the lost sheep of the house of Israel” (Matthew 15:24). Is this disrespect of the Christian to Jesus, and is to be denounced.??? Even the Vatican didn’t object yo Italy holding its general election on the 24Feb2013 – a SUNDAY. This guy is doing nothing but trying to stir up hate. do it in weekdays, people complaint they have to work and cannot vote. so when the best day? The best day? Bishop says do it only on his birthday! Kiasu, Don’t comment like that lorr… My stomach burst to laughter..
LOL! or maybe, put him as a dictator. no need to vote anymore. So, people can go to church everyday even on his birthday to praise him. This China Man Tan is ripe for SOSMA.. He is using the colonial religion Christianity to stir up hate against the Govt of the Yang Di Pertuan Agong.No place for church to meddle in US Govt or Italy less so in Malaysia. Go complain to the Pope at Vartican so they could issue a ‘fatwa’ to remind world leaders not to hold election day on Sunday..
both of them easily put a “fatwa” now is the best time this guy to join then..
Its funny that in this blog which espouses to decry the “Politics of Hate” the loudest sentiment one hears reading through the responses is that of scorn and derision. Precisely the type of behaviour that is accused of others. Where is the example of listening which is championed so loudly. Listen to the man carefully. To the essence of his complaint. You have even made it clear in bold red font yet how many supporters of this blog have taken the effort to hear. It is the “reflection of the callous insensitivity towards Christians” which the Bishop complains about. In today’s context (who knows what context might those three years have had or what complaints were registered or not), with all the claims made about inclusiveness, could you imagine what would be the complaint if the election was set for a Friday. If its unthinkable, out of a sensitivity for the Muslims, is it not insensitive too for the Christians, assuming we take them for fellow Malaysians of equal standing. Let’s not kid ourselves and call names like hate politics and 1Malaysia when you too are guilty of the same hate and lack of inclusiveness as though you are different from the others. 1. Paul Tan has tried to discredit the Government at every opportunity, even during his sermons. 2. Paul Tan has incited people to hate the goverment and other races and rise against them. 3. Paul Tan has endorsed a political party that has made hate its MO. And yet you still asks us yo listen. I have listened enough. You now have to see the facts. Even most of Olympics opening ceremony was on Sunday. Talk to the hand lah Bishop. Ini Kalilah? I would say, LAIN KALILAH or maybe JANGAN HARAPLAH.